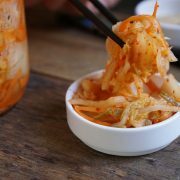 If you’re Korean at heart and don’t mind the pungent stench of fermenting cabbage, you’re in the right place. 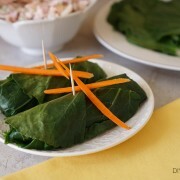 I adore collard wraps. They pass the handheld food test quite well and don’t feel like a salad in disguise. 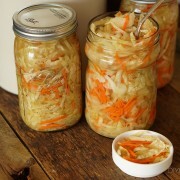 I’m a big fan of home fermentation projects, and homemade sauerkraut is excellent for DIY probiotics. We eat a couple of spoonfuls of this kraut nearly every day. 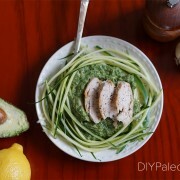 Zucchini noodles make an excellent substitute for the wheat variety. Any time you can pack more veggies into your diet, more power to you.